Track down thirty-two almost-mythical artifacts for a museum's collection. Talk to Torasa Aram about the Museum of Artifacts. Seek out one or more of the items listed below. Talk to Torasa Aram again, with one or more of the items. Sell, keep, or donate the item(s); dialogue options about each will be available. Torasa Aram can be found in the Museum of Artifacts, located in Godsreach next to the Craftsmen's Hall. Talk to her about the Museum and she will tell you that it is a privately-funded enterprise dedicated to collecting and displaying the artifacts of the world. If you bring her artifacts, she will buy them from you for a maximum of 30,000 gold. There are 32 artifacts that Torasa will take for the museum. Each item can be sold for half of its nominal value, up to the 30,000 gold ceiling, or, if you have reached a certain point in the quest The Blade of Nerevar, you can choose to donate it to the museum instead. At least two artifacts must be donated in order to complete The Blade of Nerevar quest. If you plan on completing the Tribunal Main Quest, make sure not to sell all of the artifacts on the list, leaving at least two to donate. The quest never finishes, even if you bring Torasa all the artifacts on the list. If you donate or sell an item to the Museum, and then steal it, you cannot donate that item back to the Museum. If you speak to Torasa about a stolen item while it's still in your inventory, she will alert the guards. This also applies if you added another unit of the item to your inventory with the AddItem console command after giving her the original item. While Aram will give you the best price for these items under normal circumstances, it is possible to sell all the artifacts for full value by exploiting Creeper or the Mudcrab merchant. 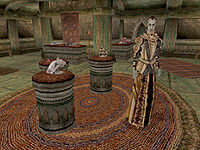 Some of the items mentioned in Tamrielic Lore, like Scourge and the Fists of Randagulf, cannot be sold to Torasa. 10 The Museum is privately funded, and is an effort to collect and display many of the artifacts from this part of the world. Should you want to sell something you feel the Museum will be interested in, bring the item here and we can assess its value. Be warned, however, that theft is a serious matter, and likely to equal a death warrant for any foolish enough to attempt it. This page was last modified on 27 October 2018, at 04:44.